There it is. The sign. Right there. The airport-shuttle driver is pointing at it from the driveway in front of my hotel. The Rio, home of the 2014 World Series of Poker. Wait a minute, jocko. Are you insane? Sure it looks like you could reach out and touch that Rio sign, but everything in Las Vegas is farther away than it might seem. Much farther. A pocket pair, for example. Also, luck. Also my hotel room at Bally’s: an inexplicable 40-minute wait to check in. Also, the Internet at Bally’s: $20 a day if you want to use that iPad. Also, restaurants at Bally’s; because of the stupid 40-minute wait to check-in, everything is closed, so it’s a 15-minute underground hike to a pathetic Sbarro’s where there’s a 10-minute wait for a cheese slice. Post-slice, it’s too late to catch the shuttle over to the WSOP, so that’ll have to wait until tomorrow. 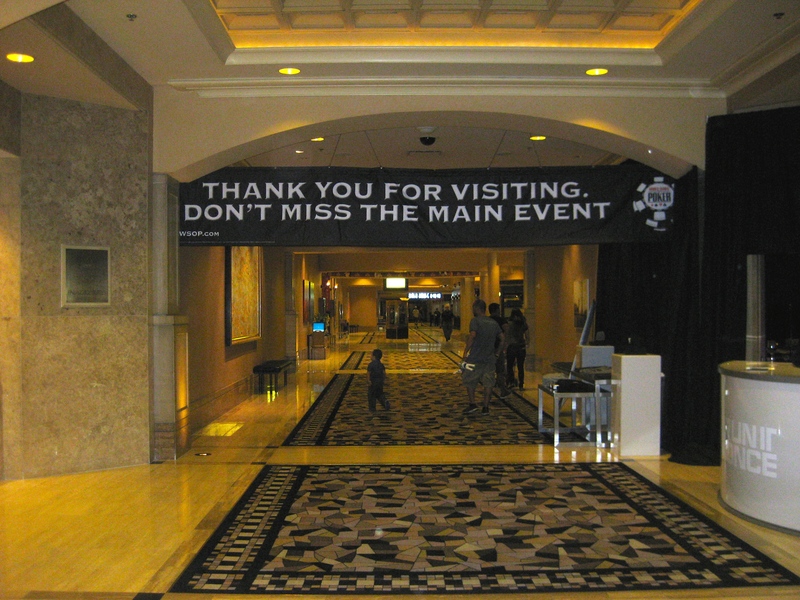 Also far away: the Amazon Room at the Rio, where the WSOP Main Event is being played. From the front door of the Rio where the shuttle from Bally’s drops you, it’s a half-mile trek through the casino then down one hallway after another. Past the oxygen station, past Hash House A Go-Go, past the “Welcome to the World Series of Poker” sign – still a quarter mile to go. 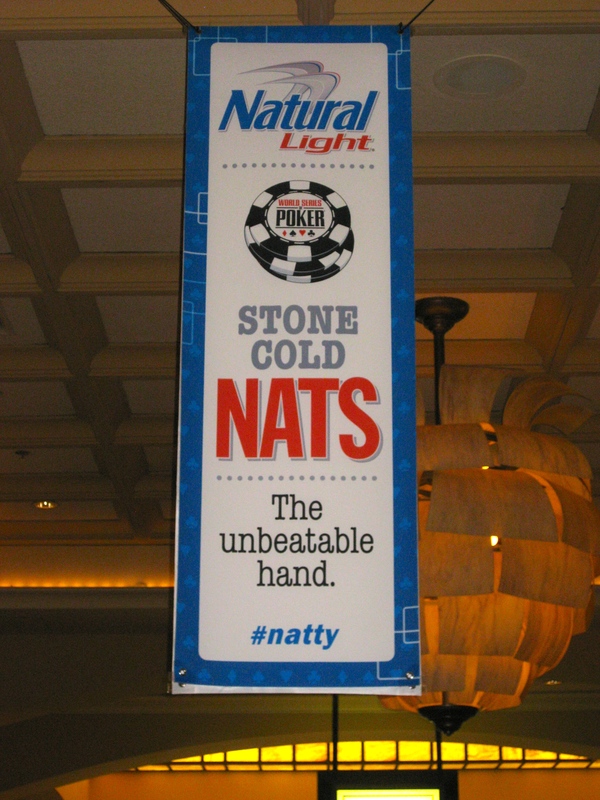 Past two signs with the headline “Stone Cold Nats.” Past the Poker Kitchen (hey, it’s beginning to look like a poker theme park! ), past the Brasilia Room—where I’ll play in a WSOP side event later this particular day—past the stacks of All In magazine and Ante Up, past the souvenir stand and the book stand, until you arrive at the nexus of the poker world, at least on this Friday afternoon: the Amazon Room. Inside is Day Four of the Main Event. Awww, they knew I was coming. In contrast to the Strip, where chaos reigns 24/7, the Main Event is a paradigm of quiet efficiency. Conversations are muted. Video crews—there are several—glide with precision from table to table. 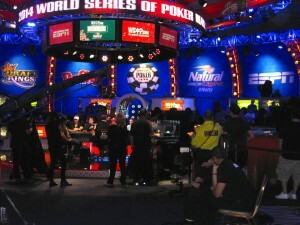 On the north side of the room is ESPN’s featured table, lit for TV, ringed with cameras and several dozen spectator seats, with an announcer providing the play-by-play. From my angle—behind video village, where the crew from Poker PROductions is milling about—it’s difficult to see the faces of the players. There he sits: cold-eyed, expressionless gaze. Downright scary. How scary? Let me tell you. A few minutes later, I’m on the outside patio, where a handful of players are milling about with their cigarettes in the 105-degree heat. A 40-something Brit who’s just busted out of the Main Event has an Ivey story to tell. Seems Ivey was seated at a neighboring table, where a young opponent with 180,000 in chips announced “all-in.” Ivey, with 250K, thinks it over and calls. The two players flip over their cards. The flop (the first three communal cards) have given the kid an open-ended straight draw. Ivey has a set (i.e., three of a kind). Ivey plainly has the lead. Two cards to go. The turn card is revealed, giving the kid his straight. One card to go. The kid stands up and begins to walk away from the table. The next card pairs the board, giving Ivey a full house. File this one under The Power of Negative Visualization. Clearly it’s time to exit stage left. Day One of the Main Event began with 6,683 players, who each shelled out $10,000 or made their way into the tournament through much less costly satellite games. Now, back inside the Amazon Room on Day Four, they’re down to 695 players, of which 693 will finish in the money. “In the money” means that you’ll go home with anywhere from a few thousand dollars profit up to the grand prize of ten million smackeroos. Was there a sadder tale of misfortune than Mr. 695, two players away from the money? Mr. 695 has a full house. Mr. 695 goes all-in. Mr. 695’s opponent catches quads on the river. Mr. 695 takes the walk of shame. Everybody who plays tournament poker at one time or another takes this walk, and it can take many guises. In a tip o’ the hat to Monty Python, let’s lump them together under one category. Your chips are all gone. You’ve busted out. There’s no rebuy, no salvation, no poker-chip-shaped life preserver. And so—no getting around it— now you must leave. How you do so defines your emotional state of mind and to some degree your personality. Mr. Nice Guy. You’re played your best, you’ve been legitimately outplayed and so you’re gracious. You smile at the guy who just took all your chips and say, “Nice hand.” Then you turn to the table and say, “Good luck, everybody.” You turn and walk naturally to the exit. Everyone should be so pleasant. The Mangy Mutt. You are top dog. Look at that pile of chips! Oh, yeah! It’s been growing and growing and you are numero uno, buddy! Or at least you were. Let’s admit it: You’ve kind of been a bully, gloating when you win (“You guys are my personal ATM!”), scowling when you lose. And lose. And lose. You’re on tilt because you’ve been entering pots with marginal hands using all those “extra” chips you’ve won from all these chumps. Until that one-two punch in which two of your actual good hands get eaten alive by bad beats (just like the ones of which you were the beneficiary) and suddenly you are not gloating anymore, because you’re all in with a pair of jacks against ace-king and… you’re toast. You rise slowly from your chair, shaking your head. Your shoulders slump and you skulk way, a mangy mutt who’s pooped on the kitchen floor. Mr. Shellshock. Hey, wait a minute. There’s something wrong here. I’ve got three kings, but the dealer is sliding my chips over to that idiot kid across the table who turned over five-three off-suit. What do you mean, I lost? What? What do you mean he caught his straight? I don’t see a— Oh. You sit there a moment. Your fellow tablemates offer words of commiseration (“Wow, man, that was ugly”) and you exit the room, exit the building, go to the parking lot, shift your car into drive, and realize that you’ve left your iPhone at the table. Back you go, across the parking lot, into the card room, crossing the battlefield, retrieving your phone, unnoticed by your former fellow players because, let’s face it: To them you no longer exist. The ER Patient. Pocket aces: You’re golden. The showboat to your right raises. You reraise. He reraises. You go all-in. He calls and shows pocket deuces. 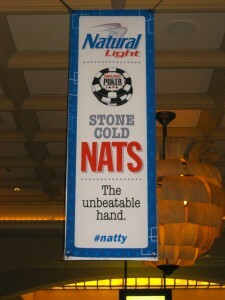 You simply cannot lose this hand! The flop comes. No ace, no deuce. Your aces are holding up. The river card is flipped over. No ace. No deuce. You’re at the finish line, baby! The river card is… a deuce. Owwwww. That really hurt. Bad. Tears-welling-up-in-the eyes bad. A sinking feeling that extends from your cranium to your pelvis. Nurse, get the defibrillator. Clear! Jaws agape, you stumble away in a haze. But you need medicine to numb the pain. Lucky for you the dispensary is open until 2am and they will gladly provide any number of elixirs guaranteed (almost) to help you forget that damn river deuce. The WSOP Walk. Yes, everyone gets their chance to demonstrate their walk of shame. I got a chance to strut my stuff at the Rio’s Brasilia Room at about 9:30pm Pacific Daylight time on the final Friday night of the WSOP. Until Henry Orenstein came along, the game of poker was nearly unwatchable on TV. (To some, it still is.) He’s the fellow who invented the hole-card cam, which revolutionized TV coverage of the game and contributed mightily to poker’s resurgence. But the hole-cam wasn’t his most impressive achievement. He’s a Holocaust survivor who spent his teenage years in five concentration camps. PokerNews has a brief yet enlightening story about the man. Atlantic City is on the ropes: No big surprise, but it’s encouraging that they’ve come up with a new game plan. Last decade, Dan Harrington and Bill Robertie co-authored the “Harrington on Hold’em” series, arguably the best available set of poker manuals. Now the duo is back with “Harrington on Modern Tournament Poker,” which presents a significantly revamped version of their earlier, conservative approach to the game. Like the earlier books, this one is nicely written and presents smart, useful, clear-headed information in an easy-to-digest format. Reading it will pretty much guarantee an improvement in your game, so please do not buy it, especially if you plan to play hold’em in the vicinity of Portland, Oregon.